I’d been craving the slightly salty chew of choux pastry and had a litre of cream in the fridge. Time to whip up some éclairs. It’s not really whipping, because it involves quite a few steps and time so you may find that by the time you’ve finished making the éclairs, your creamy zeal has kinda faded. They still taste BANGING though. Yes I said banging. 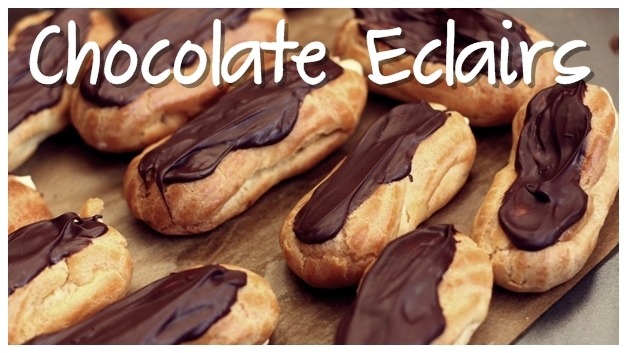 Ever sat and thought about that éclairs are just long profiteroles. Its a question to ponder over. Or that profiteroles are just short round eclairs? Which came first? And why aren’t profiteroles called small eclairs in french? And sorry, no crème pâtissière, I’m so used to commercial eclairs stuffed with whipped cream I can’t bring myself to leave it. It also gave me the opportunity to try some ‘darker’ photos. Eclairs have this rustic ‘I-don’t-give-a-crap-that-I’m-hollow,’ look about them, so my over exposed bright cake look doesn’t seem to fit.